StinkySocks Hockey is an adult hockey league dedicated to providing a great experience on and off the ice. We started in the Boston area in the winter of 2006 with the goal of creating an ice hockey experience that was difficult to find… a hockey game, more structured and dependable than pickup hockey, but without the nonsense (fights, disrespect, etc.) that we all too often found in other New England area hockey leagues. We are a year round hockey league that consists of players (men and women) who all have to get up the next day and who have come to grips with the fact that they are not skating for the Stanley Cup. Our players want a competitive game of hockey, within their appropriate skill level, in an atmosphere that is friendly. We have continued to grow while maintaining these values in our player base and all games. We work tirelessly to ensure that all games have two goalies and a referee is always present to provide the highest quality hockey experience. StinkySocks Hockey continues to grow at a rapid pace with players just like you! We offer leagues that you can join with a team or as an individual. We offer game by game play through the No Commitment Hockey program, as well as local and travel tournaments. Our hockey tournaments span from New England to Canada and StinkySocks Hockey hosts leagues and individual games in Boston and the surrounding New England area. Whether you are new to hockey or getting back into the game after years off the ice, there’s something for you at StinkySocks Hockey and we want you to be a part of our community. We are a league that offers well-organized, competitive (but not aggressive), dependable, and friendly hockey with a group of great people who enjoy competing. This is hockey, redefined. We’re dentists, firefighters, doctors, businesspeople, policemen, lawyers, electricians, and teachers, to name a few. As StinkySocks Hockey players, we share a genuine love of hockey. We want to enjoy competition, camaraderie, and get a good workout. We don’t want, nor do we tolerate, the nonsense all too often associated with adult hockey leagues (fights, dirty play, disrespect, etc). We’re proud to offer a welcoming environment where you can play hockey at your skill level and allow your skills to grow with the StinkySocks Hockey community. StinkySocks Hockey stands behind this mission to provide a quality experience and we have polices in place to ensure the continued enjoyment of the game. We monitor conduct on an ongoing basis and take swift and equitable action when any individual acts in a way that is contrary to our players’ values, in accordance with our polices. 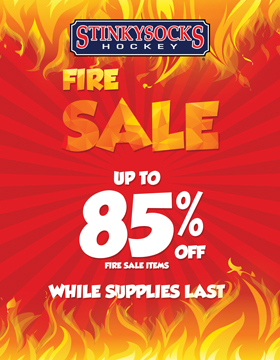 StinkySocks Hockey players enjoy the best value in Boston and the New England area. We keep the benches to ten players and one goalie per team to make sure that you’re spending more time on the ice than off. That amounts to 50% more time per game on the ice (compared with other area leagues that have benches of 15 players). StinkySocks Hockey offers this while keeping prices an average of 20% lower and requiring no annual fees. We offer the best value hockey experience in the Boston and New England areas.